Michael: Fictional prophecies are a tricky thing. Typically, the prophecy is either dead-on or has been slightly misinterpreted, but either way it usually comes with a twist. Nick Spencer has played with a lot of elements from Marvel’s last big crossover event Civil War II, but none moreso than Miles Morales clutching Steve Rogers’ lifeless body on Capitol Hill. Secret Empire 7 finally approaches that moment…or does it? With three issues to go, we are in the home stretch of Secret Empire and The Resistance is growing thinner and thinner. 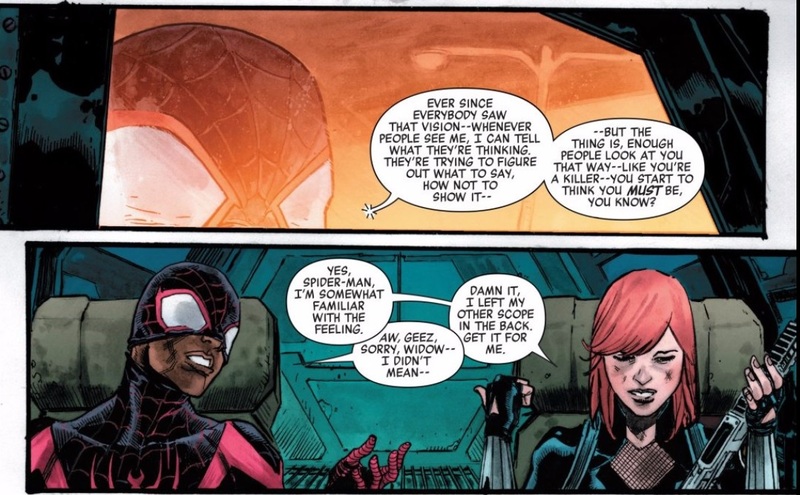 Though Secret Empire 7 features a few separate scenes following Captain Marvel and Steve Rogers, the bulk of this issue is dedicated to Black Widow and her “Red Room” team, specifically Miles Morales. Spencer gives both Miles and Natasha Romanov a hell of a lot of material in this issue, which serves as a kind of new direction for Miles and a send-off for Natasha. The climax of this issue comes on the steps of Capitol Hill with Miles and Cap, just as the Inhuman Ulysses’ vision foretold. BUT once the dust settles, Cap isn’t the one dead , Natasha is. 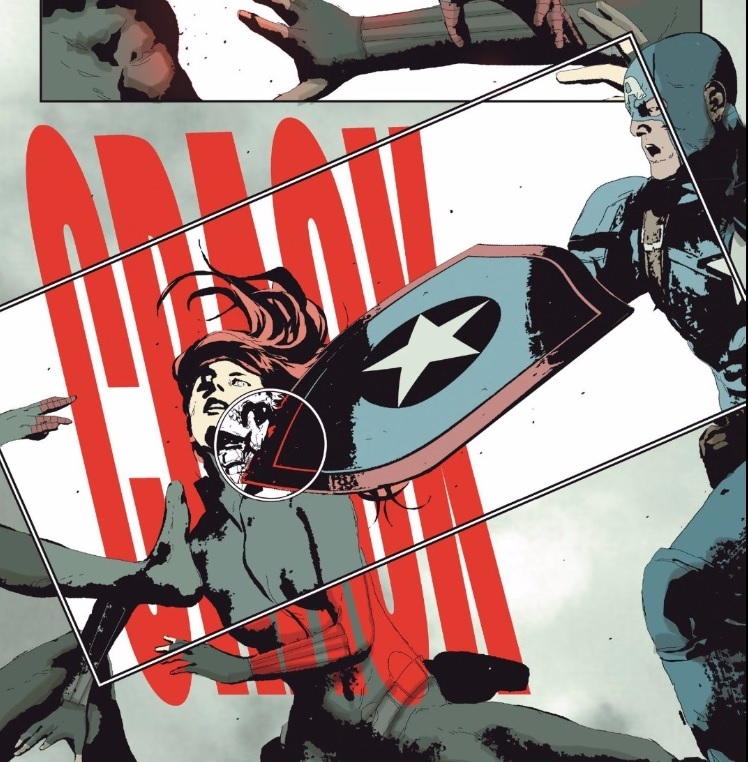 Earlier in the story Nat locks Miles in a Hulk-containment transport and here she jumps in the way of Cap’s shield, saving Miles and sealing her own fate. Miles is now fully committed to what he sees as his destiny and is ready to kill Captain America. And while Nat is totally about killing Cap, she doesn’t want Miles to be the one who does it. The idea of an old killer pulling the trigger themselves to keep their young partner’s hands clean is a cliché, but it’s a damn powerful one. After all, Nat’s youth was wasted by being turned into a murder weapon; she’s going to spare someone else from that fate if she can. Spencer has devoted a lot of time to Nat as the hard-edged veteran leader in Secret Empire, so it shouldn’t come as much of a surprise that she meets her end here. With that inevitable, painful neck-snap in sight, Spencer and Andrea Sorrentino give her some amazing sequences prior to her death. First and foremost, Spencer showcases Natasha as a master strategist. She’s planned the hit on Captain America with the rest of her “Red Room” team but doesn’t inform them of her Inhuman ace-in-the-hole Mosaic until shortly before she uses him. 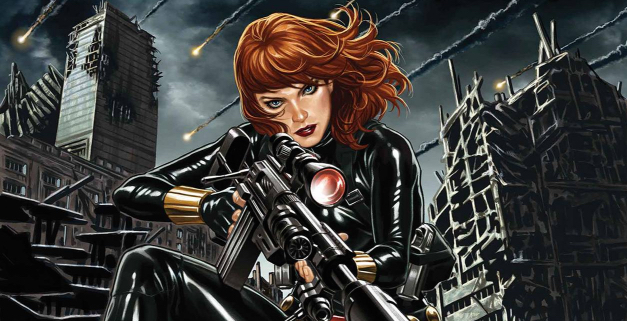 I’d also like to reiterate: Black Widow has planned a hit on Captain America. 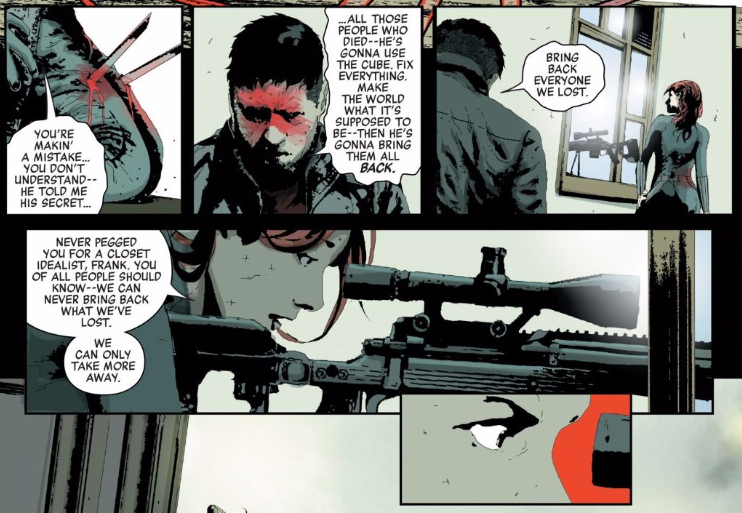 We know Black Widow to be a skilled assassin but Andrea Sorrentino drawing her with her sniper rifle perched on the windowsill brings it to a chilling reality, akin to a presidential assassination. Sorrentino does his action deconstruction magic in a couple of fabulous sequences: first when Nat faces off against The Punisher and finally when she dies protecting Miles from Cap. Having one of Nat’s final battles be against fellow killing machine Frank Castle is such a perfect choice. To be honest, I don’t think that ‘ol Frank would side with Cap with the reasons he gives Nat, but the fight is still an adrenaline rush. 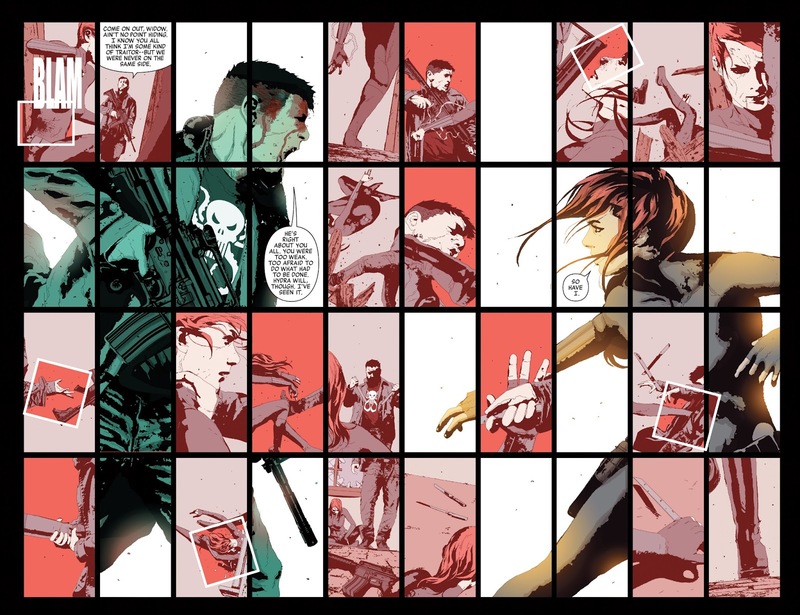 I think my favorite sequence from the Punisher/Black Widow fight is Sorrentino’s most complex. In a double-page spread, Sorrentino breaks down the fight across a 4×10 panel layout. The looming background of Frank screaming at Nat as she’s poised in a defensive stance serves as a gigantic first or final panel of the page, depending on how you look at it. The layout reminds me of an incomplete puzzle, with the smaller “missing piece” panels highlighting the blow-by-blow action of the fight. It’s a hell of a visual that just barely tops the conclusion of the fight where we see a variation of the Black Widow sting. Though he makes it out of the issue alive, Secret Empire 7 really puts Miles through the wringer. Perhaps because he’s a Spider-Man or just because he’s a fan favorite, Miles has become the de facto leader of the Red Room team — or at least its Lieutenant Commander. After spending most of the series trying to do things differently from Black Widow’s more murdery ways, Miles has finally accepted that maybe it’s his destiny to kill the now corrupt Captain America; but he’s robbed of that. Climate change denial, healthcare repeal, LGBTQ rights infringed — pick your allegory. Miles is fed up with Cap’s nightmare vision at his friends’ expense and shares their collective pain with him. Raging against the machine can only do so much however, and his teammate Nadia talks Miles down from taking it too far. It appears that The Red Room team gets apprehended but at least they live to fight another day. Oh boy Spencer! What did you think of Secret Empire 7? There’s a bunch I didn’t touch on. Did you like the focus on Carol in the beginning? I understand that she feels partly responsible for what’s happened but I also don’t fully support the idea of keeping everyone trapped on the other side of that shield, to fight wave after wave of Chitauri. And how about Sharon trying to kill Steve? Is he delusional to think that she’d be sympathetic to his plight? Do you think she held back from actually killing him? Spencer: I do not for a second think that Sharon held back — her blade was on his neck, held back only by Steve catching her hand. Before she lunged, I actually thought Sharon might kill herself simply to spite Steve, but that’s not Sharon Carter — she’s a fighter, and that’s why I believe she fully meant to take Steve’s life. And yeah, Steve is absolutely delusional to think Sharon would listen to him, much less show him any sympathy. That said, Steve has quite literally been delusional throughout Spencer’s entire run, since the Cosmic Cube essentially rewrote Steve’s past to make Red Skull and Kobik’s delusions into Steve’s new reality. On a more metaphorical level, Steve’s also delusional to think that he can ever fully take control of his future, or of reality itself. Natasha herself points out his folly. 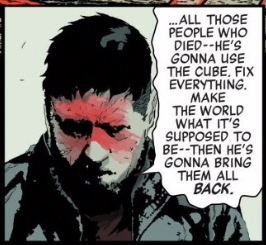 The Cosmic Cube could give Steve the power to have everything he’s ever wanted, to bring back everything he’s lost, but by bringing back his friends as Hydra cronies he’d still be losing so much of what made his friends worth knowing in the first place. It’s also likely that, the more Steve struggles to gain that control, the more it will slip through his fingers. If nothing else, there will certainly be many more losses just as tragic as Natasha’s before Steve’s done. Since we’re on this scene, let’s talk about the Punisher for a minute. Michael mentioned that he didn’t buy Frank’s motives for working with Hydra, which is fair, but I disagree. Frank’s vendetta sometimes leaned pretty hard into fascism long before Secret Empire, and chillingly enough, in real life we’ve seen Punisher’s symbol — and with it, no doubt his beliefs as well — co-opted by actual cops. The same cops out there killing unarmed children of color are painting Punisher skulls on their cop cars, and it’s absolutely terrifying. For someone who already views all those who break the law as irredeemable scum, fascism isn’t that great of a leap. That said, all of that is only Frank’s secondary motive — his true reason for joining Steve is buried in subtext, but clear to anyone even halfway familiar with the Punisher’s backstory. Frank just wants his family back; that’s all the motivation he’s ever needed, and that certainly hasn’t changed. Regaining and protecting family is actually a motivation that’s abounded throughout Secret Empire, motivating both the Odinson and Ant-Man to betray their friends in different ways as well. They’re putting family above the greater good of the nation, which is incredibly dangerous, yet understandable on some level. On the opposite end of the spectrum is Carol Danvers, who is taking her devotion to justice to equally reckless levels by refusing to retreat from the Chitauri attack and regroup. Carol’s sense of honor and justice is so strong that it won’t allow her to leave her post, even if it’s probably the smart decision to make in this situation. This feels very much consistent with the Carol Danvers of Civil War II, who couldn’t bare to see anyone Ulysses could have saved suffer, even if it meant overlooking the many glaring flaws in the methods surrounding him. That was really Carol’s fatal flaw in that conflict — Spencer’s explanation in this issue that she felt insecure and just wanted to prove herself doesn’t ring true for such a confident character. That’s a moment that feels more like Spencer is trying to bend Carol into his political allegory even if she doesn’t fit. Somewhere between Frank and Carol is Miles Morales, who lets go of a chance to kill Steve Rogers in order to honor Natasha’s desire for him not to become a murderer. In the moment it’s another ill-thought out priority like Frank or Odinson’s, but assuming Miles survives Secret Empire, it will eventually make him an icon. In front of the world, Miles Morales just showed that he was better than Steve Rogers, not through fisticuffs (though he did that too), but through morality. Since Civil War II I’ve been excited about the idea of Miles defeating Hydra-Steve simply because of the symbolism — this young boy of color representing the next generation of superheroes taking down a corrupted, ancient institution is an idea that has a lot of power, especially in today’s political climate. With Miles no longer in the running for this role, it falls to a new player. In many ways Sam being the one to rally the troops against Steve is even more powerful. He’s a symbol of what America should be, not what it’s become via Steve’s hateful right-wing rhetoric. He’s a person of color reclaiming a concept that’s been used to discriminate against him. He’s also a long-time friend of Steve Rogers’, and at the moment that may be what interests me most. It will create a juicy conflict between the two when they finally come face-to-face, for sure, but it also sets up yet another real-life parallel. In this case Sam’s the person who has to try to correct their crazy racist uncle. That’s an important role to acknowledge. Young people like Miles Morales shouldn’t have to carry the burden of enacting change all on their own just because they’re energetic and idealistic — we all have a part, and like Sam, many of us are even better qualified to make a difference. I did enjoy secret empire # 7, Spencer does decent job writing Carol, however, I don’t agree with the idea that she’s turned out just like Tony. This isn’t ’ even the first time that Spencer brought up the Carol become just like Tony thing during Civil War II the oath Steve said the same thing about her. Also, said that Carol had a subconscious need to prove she was better than Tony, it kind of felt like Rogers was projecting a little bit when he said that. Although that probably wasn’t Spencer’s intent though. Hasn’t the need to prove herself been a big part of Carol since House of M? That she truly wants to be the person that she was in House of M? Constantly tryign to push herself to be the best hero she could be? I can see her turning into Tony, especially once you give her some power. THe need to find the one solution, to the point of alienating others. I’m stopping my structure thing, as between the film festival, the amount of work each one takes and the fact that this is only a week after the last issue, I don’t have the time. This is an intense issue. THe Underground’s massive payoff was far messy than it should have been, but this has the advantage of having focus. The scope of plot elements is a lot smaller, and so instead of a series of reveals (like the mole hunt that… didn’t go as planned), we have an issue dedicated to emotional climaxes. That isn’t to say that this doesn’t have poorly done reveals, the Mosaic reveal should have been done when they saved Mosaic instead of waiting all the way until now, but there is nothing as disruptive as accidentally messing up a Mockingbird red herring to the point of ruining the tension. Emotional arcs at the highest stakes are the order of the day. Where the last issue used New York to contrast hope and hopleness, this issue uses the space sequence to show the impossibility of the task. 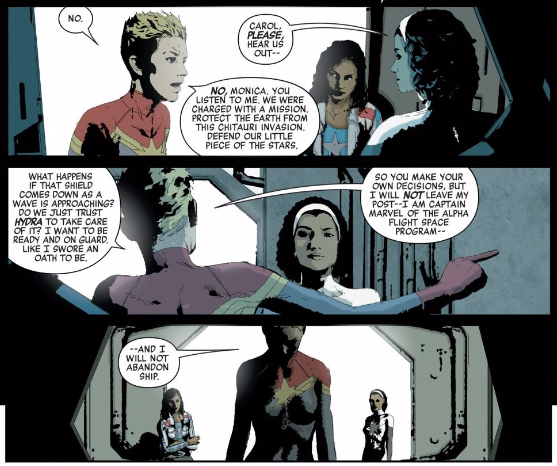 Carol is faced with a choice to fight or run, and it is the impossibility of the fight that she chooses that we are supposed to think about as we see Natasha this issue. By making it so difficult, it makes Natasha’s actions so much more meaningful. Already, SPencer has completely recontextualised last issue’s speech about preparing the kids by showing that, despite everything, Natasha was fighting for their innocence. She was preparing them, but that was because Natasha wanted them as protected as possible. But all of that was secondary to making sure they were never in that situation in the first place. Ultimately, the Red Room was the backup plan, because despite everything, Natasha was trying to play the hero (with more room, there could have been a very interesting space for a subplot between Natasha and Nadia, since Nadia, unlike the others, is damaged goods. Of Nadia being given a major role, despite being the most outspoken against Natasha, because at the end of the day, Natasha and Nadia agree that Nadia is the one who has already lost that innosence. THough Nadia speaking as MIles’ humanity at the end was pretty great as well). It is why it is a shame that they mess up the page where Natasha gets in the way. The problem here is complex. Sorrentino’s art always has a high degree of impact, which usually makes very clear the sheer physical toll of a fight. But here, it does the opposite. It obscures what exactly is happening, because we struggle to see how it is different to everything else SOrrentino has done. It is much bigger, but the same visual tricks for very survivable injuries in the Natasha/Castle fight are used. And getting hit with a shield has never, in the context of comics, been seen as lethal. So what makes this different to your usual Sorrentino impact? I’m honestly surprised when people said Natasha was dead, because I expected Natasha to be imprisoned, heavily injured. The panel certainly shows Natasha taken down hard, defeated for fighting to save lives instead of taking them, but I didn’t read it as death. It is jsut isn’t different enough to your average Sorrentino impact. Regardless of whether Natasha is dead or not, it is certainly a great ending. Everything the issue does puts Natasha through the wringer, so that we truly see her as powerful and commited. THe fact that she went through that much to get that far is what makes her takedown powerful. None of it on either side feels easy. Every side poured everything into it, and the fact that the bad guys won and the good guys lost when Steve smashed his shield into Natasha makes this a major climax. THis is how a plot resolution can become a truly powerful emotional resolution, even if it is a much sadder, more tragic emotional resolution than we want. Not all sad though, becaus ein a way, Natasha won. Both in teh fact that she (and her symbolic soul, Nadia), saved Miles’ soul, but because in the end, Natasha whatevered for the values of Captain America. And at the moment, those values are on the rise. From a purely literal standpoint, HYDRA won the day. But on every other level, on every level that counts, HYDRA lost. Steve returned from his assassination attempt to meet… another assassiantion attempt, SHaron’s nearly successful attack showing the loss of control Steve was struggling with at the start. Despite ‘winning’, HYDRA is collpapsing. And despite everything, the Underground had tis biggest win yet. Captain America is back. The values that Steve reject, that Steve fights to quash, are now stronger than they have ever been in this story. Because the mantle of Captain America has been reclaimed, and Natasha’s ‘defeat’ is the great victory the Underground have been waiting for. The values of the best of us will rise from the dark. THoguh this issue makes very clear jsut how much of a waste of time the dream stuff has been. There has literally not been a single poitn where the dream stuff is different from Sam Wilson’s arc throughout the book. THere was hope with the Red SKull, but that was quickly dashed. Instead, literally everything those dream sequences have been about, on the values that make Captain America great and the need to have that figure stand up and fight, has been Sam WIlson’s story. And as he stands there, holding the shield high, I can’t help but feel everything would have been so much better if the space given to a dream would be better spent with Sam. We really didn’t need the same arc twice. 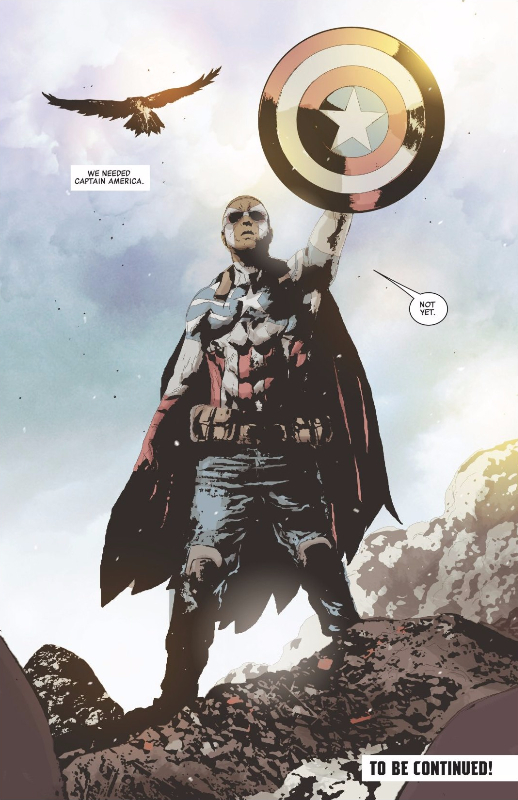 Especially when it is so much stronger with Sam Wilson, who makes clear that the things that makes Captain America valuable aren;t about the man himself, but things that any man can choose to represent. Something I forgot to comment on after this was published, re:The Punisher. I’ve grown to love the psychotic Frank Castle, mostly due to Jason Aaron and Steve Dillon’s PunisherMAX run. In it, hired Punisher assassin Bullseye locks himself in a room until he can “solve” Frank Castle. In the process Bullseye drives himself mad(der) and realizes that Frank losing his family didn’t make him The Punisher, he was ALWAYS The Punisher. Even as I am reading Garth Ennis’ groundbreaking run, I think that this will always be my Punisher gospel. Whereas Bruce Wayne could’ve lived a normal life if his parents survived that night in Crime Alley, I think that Frank Castle would’ve always become The Punisher no matter what. That might not be something that he openly admits but I believe deep down he knows that no many how many criminals he kills, he will never fill the void in his soul. In that context I don’t believe that he buys into the idea that bringing back his wife and children via Cap’s cosmic cube will make him whole. Frank Castle is a man both broken and birthed by war. His family’s death was merely a breaking point. To be fair, Steve was also providing him an army. It was the best of both worlds. He could get an army to become the ultimate PUnisher AND get his family back. The idea of Frank being the man who never came back from Vietnam, the man who has to be the Punisher because he needs a war to fight, doesn’t have to contradict the idea that Castle always wants his family. If he had to choose, he’d choose the war. But if he doesn’t? Why not get both? Also, I thought Ennis was the person who introduced the idea that, ultimately, Castle was the Punisher, and that was more important than literally anything else, even the family he uses to justify himself? Was I wrong?